Nestled within the city’s Garden District, Ivy Condos is a 235-unit residence coming soon to downtown Toronto. The 30-storey point tower takes a fresh approach to urban condo living through bold architecture, luxury amenities, eco-friendly features, and an excellent location. Ivy Condos is a new condo development By The Sher Corporation and Dream, Sales for available units start from the low $300,000’s. The development has a total of 235 units. Inspired by its natural surroundings just steps from Moss Park and Allan Gardens, the RAW-designed building blends a contemporary glass skin with white and wood textured metal panelling and a frosted ivy leaf pattern that reaches from the ground to the top of the podium. Further differentiating it from other projects is the tower’s bold exterior architecture characterized by varying sized balconies, a combination of glass balconies, and a series of defined, boxed out architectural balcony projections that draw the eyes up along a dynamic facade. Eco-friendly elements are echoed inside where homeowners and guests are greeted to a warm and inviting lobby complete with a living green wall. Ivy is seeking to achieve the City’s Tier II Green Standard. The development uses a combination of large porcelain sheets on the floor and walls with wood elements to create a clean and modern entrance that feels organic, natural and beautiful. As the old adage says, real estate is all about location, location, location. And that’s exactly what Ivy Condos has to offer. 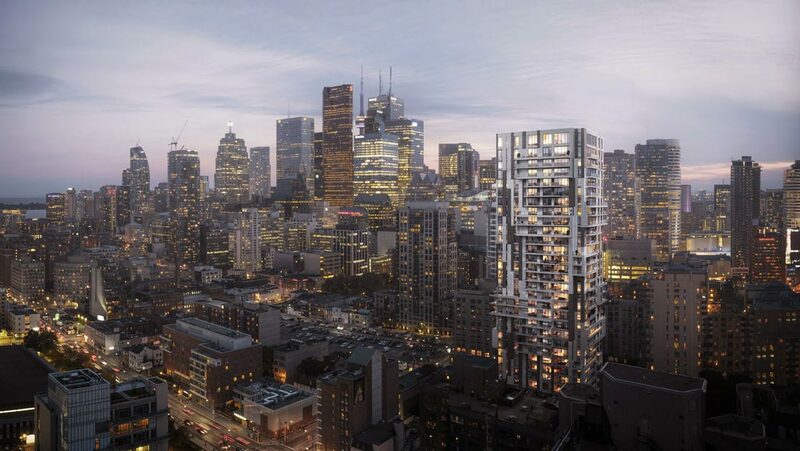 The project’s urban setting — between Dundas Street East and Shuter Street — is ideal for young professionals or families, and makes for a great long term investment. Whether you choose to walk, cycle, or take the TTC, you’ll have easy access to a wealth of local amenities and conveniences including Ryerson University, the Eaton Centre, Maple Leaf Gardens and the Dundas subway station. 7 minutes to the Eaton Centre, and Dundas subway station. 2 minutes to more amazing restaurants than you can count. Ivy Condos is a point tower rising in downtown Toronto’s Garden District. From the living Green wall in the lobby to the frosted leaf patterns on the building’s exterior, everything about Ivy makes you breathe in nature and relax.